Name: Quaker Pointe’s its all a BUZZ "Buzz"
Quaker Pointe's Its all a BUZZ aka, Buzz or blue boy has gone to live with his new family in Murfreesboro NC. There he is enjoying his life & gaining wisdom from his new buddy Polo the van Brackle's other retired Weimaraner! 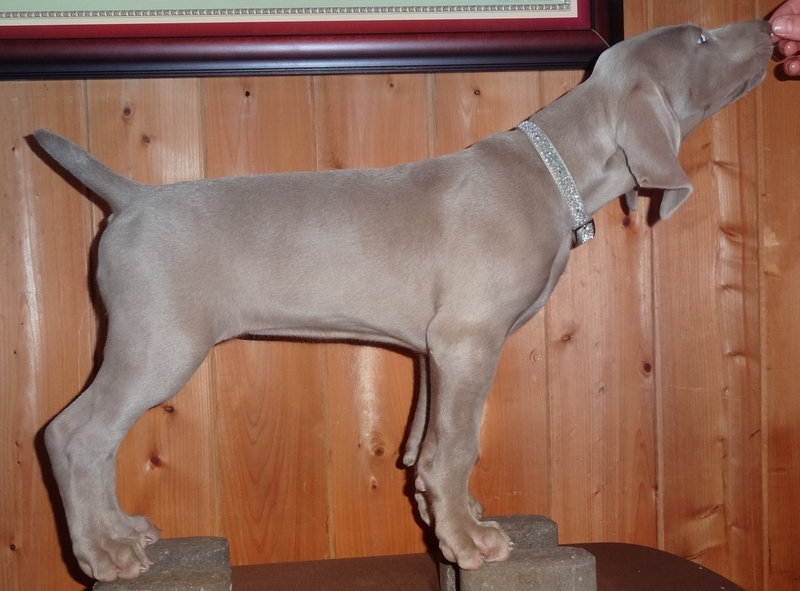 Dixon aka Green Boy was Joe Petroski's Stud puppy of the litter and He placed him with a family in Chesapeake Va. His new new family has had weims for many years and he too has a weim partner in his household. This puppy will most likely be field competed and I will update with his accomplishments as they occur. Quaker Pointe’s Urban Dictionary aka Orange girl , or TEAGAN is the puppy we decided to keep . You can learn more about her and her adventures on her personal page.